Most people have some kind of container they use to collect spare change. All those quarters, dimes, nickels and pennies can add up to a nice wad of extra spending money. But it’s not easy to find a way to cash in your coins without paying a hefty fee. John Carlucci, 69, of Lake Hiawatha, said he’s been cashing in his small change for years. On Aug. 11, he went to his bank — Provident Bank in Parsippany — carrying the large pretzel jar he uses to collect coins. He said he dumped the coins into the coin counting machine and the tally came to $231.81. Not a bad haul for small change. Once the counter was done, it spit out a receipt with his total. But it also spit out a surprise. “Imagine my astonishment when my own bank – who handles all of my financial matters – charged me a fee of $23.12 for making that deposit because it consisted of coin,” Carlucci said. 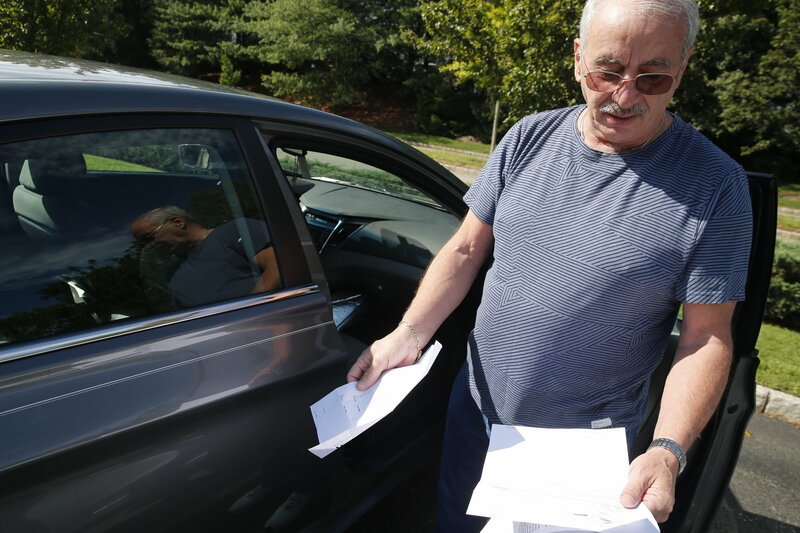 John Carlucci holds his bank statements outside the Parsippany branch of Provident Bank. He was not happy when the bank charged a 10 percent service fee for depositing a bunch of change into his account. He said he visited the teller, who explained there was a 10 percent fee for using the coin counter. It wasn’t always this way, Carlucci said. When he used the machine last year, he said, there was no fee. He said he also deposited coins without a fee in 2015. “My wife and I had painstakingly rolled all the coins to make it easier for the tellers to count,” he said. But then, the teller broke up all the rolls and dumped the change into the coin machine. The total was the same as the rolled coins, Carlucci said, and his deposit was accepted without a fee. “At the time I thought it was funny after we worked so hard and bought the coin sleeves,” he said. But apparently, this year, there was a policy change that Carlucci didn’t know about. “I can now visualize parents teaching their children to save money in their piggy bank only to bring it to the bank and have them deduct 10 percent like a bookie, a poker dealer or worse yet, the IRS,” Carlucci said. He deposited the funds, less the fee, in his money market account. Because Carlucci’s complaints at the branch didn’t get him anywhere, he wrote a letter to one of the bank’s vice presidents. Next, Carlucci contacted Bamboozled. But before Bamboozled contacted the bank to ask about its policies, Carlucci got another surprise. The $23.12 fee had been returned to his checking account, which strangely, was a different account than the one into which he’d deposited his initial coin haul. The refund came 10 days after he wrote the letter to the bank’s executive, but he hadn’t heard back from the bank about his letter. But the letter must have done the trick. Carlucci said he was glad to see the money, but he still takes issue with the policy. Even though Provident returned the fee, Carlucci said he’s going to look around for another financial institution with different policies. There was a time when all banks accepted rolled coins. Then many banks turned away from the rolls in favor of coin counting machines. Consumers liked the machines so they didn’t have to spend hours dividing quarters, nickels, dimes and pennies and fitting them into those paper rolls. Some banks offered the machines for free, but other machines were available in convenient retail locations, such as supermarkets. Those machines charged a fee. For example, today, Coinstar machines are easy to find in grocery stores, but they charge an 11.9 percent fee to exchange your coins for bills. For every $100 of coins, you’d lose $11.90 to the fee. There is a way to avoid the Coinstar fee: If you choose to redeem your coins in the form of an e-gift card to retailers such as Amazon, Best Buy, Toys R Us, restaurants and others, the transaction is completely free. The Coinstar machines also allow you to make a tax-deductible donation to organizations such as The Red Cross without a fee, and you can use your receipt for a deduction on your tax return. While we reached out to Provident about its coin counting fees, we took a look at what other banks are doing. The policies vary. Some institutions still accept rolled coins. Others offer free coin counting machines for accountholders, but charge a fee to non-customers. Take a look at other banks’ policies here, here and here. 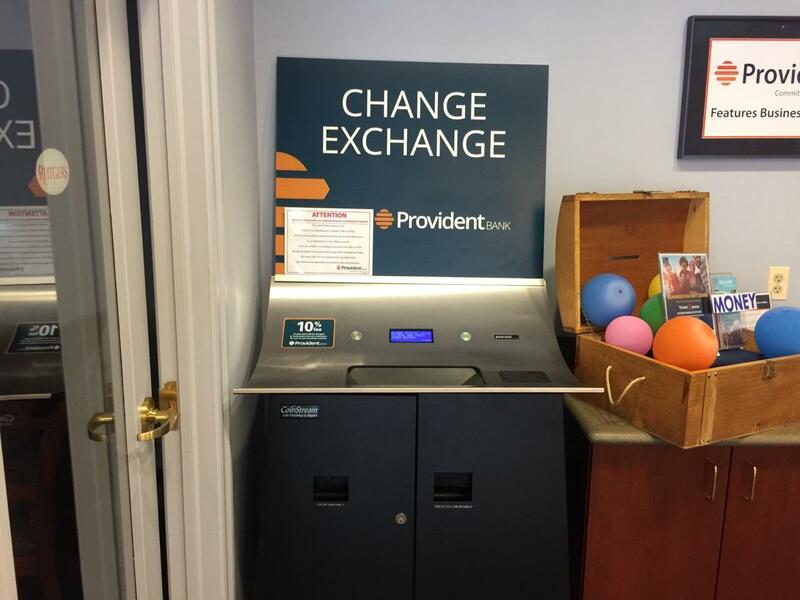 The coin machine at Provident Bank’s Parsippany branch displays a decal that warns of a 10 percent service fee. We heard back from Provident Bank, which clarified its policy. It also provided some images of its Parsippany coin machine, which shows a clear decal that warns of the 10 percent fee. Carlucci must have missed it. The bank notified customers of the change, which was effective March 1, in January statements that were sent to customers, a spokesman said. So officially, the bank no longer accepts coins without that fee, but the fee is actually up to the manager’s discretion, the spokesman said. In the case of Carlucci’s fee refund, the decision was made at the branch level, he said. “We charge the fee to offset the operating expense associated with operating the machine, as well as in response to the competitive environment,” the spokesman said, noting the fees charged by other banks and retail store coin counters. There is one way to avoid the fee at Provident, he said. “We do not charge that fee on custodial accounts and our ‘Young Saver’ account, which is an account for children,” he said. At least the kiddies can save their coins without worry. We wanted to share one other tip we found online. If you visit a supermarket with a self-checkout lane, you can insert coins to pay your bill. Just please don’t be the shopper who holds up the line in a busy grocery store as you pay with all coins. Bamboozled doesn’t want hate mail from the unlucky person who ends up behind you in line.